There are many so-called successful people who have not learned how to enjoy their success. True success should not have to cost you your joy, your health or your relationships. On the contrary, true success is about enjoying these things. Success Intelligence examines how to enjoy real, soulful success while living in a manic, busy and hyped-up world. 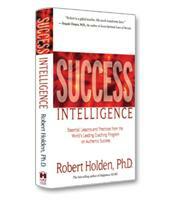 Author Robert Holden, Ph.D., describes his unique coaching program — called Success Intelligence — which is used worldwide by artists, writers, entrepreneurs, business leaders, and global companies and brands. How to create a vision for your life, work and relationships that doesn't get lost in the rush. How to identify what the real you really wants and discover the real purpose of your life. How to free your mind, liberate your talent and attract more effortless success. How to conduct a Busyness Audit, give up Destination Addiction, release dysfunctional independence and overcome your fear of success. Why happiness is the key to greater inspiration, creativity and meaningful success.